There is often a lot of focus on how to buy Bitcoin and where the price is going to move. It is easy to overlook one of the most important aspects when buying Bitcoin. If users and investors do not store their Bitcoin in high-quality wallets, there is the risk that they could lose their funds forever. There is also the matter that if you don’t control your own Bitcoin in your own wallet, it is not really your Bitcoin. You may believe that the Bitcoin that you leave on an exchange is yours but if the exchange gets hacked, the Bitcoin will likely not be retrieved. In this article, we analyse the top wallets to store and secure Bitcoin. We delve into the security provided, features, along with benefits and drawbacks of each. Hardware wallets are the most secure option when it comes to storing Bitcoin. The major hardware wallet providers are Ledger, Trezor, and KeepKey. Ledger Nano S has support for the widest number of cryptocurrencies. Hardware wallets leverage the benefits of both cold storage and hot storage. Cold storage is when funds are secured offline and represents a greater level of security. Hot storage is when funds are connected to the internet and enables the user to send transactions. The wallet can send transactions and check the account via being input into a computer and connecting to a Chrome-based app. The private key for the wallet is stored on the device itself so that the wallet is secure even if it is used on a compromised device. Ledger Nano S comes in a sealed package so that users know if the device has been tampered with. There is a clear recovery process when users are setting up the device. If the user loses their device or it gets stolen, the recovery seed can be easily used on another device to recover the funds. When users want to send transactions or monitor their account balance, they can easily connect their device to the computer and access an interface Ledger provide through their Chrome application. Users can generate their addresses or a QR code to receive transactions. There are also mobile wallets which support importing Ledger Nano S. This means that users can generate a watch-only wallet where they can monitor changes in the wallet and also receive transactions via a QR code on their mobile. Users will still have to plug their device in to send transactions. Trezor is another leading hardware wallet and the longest operating out of the three leaders. The Trezor hardware wallet which was developed by SatoshiLabs was initially released in 2014. The private key for the wallet is stored on the device itself making it highly secure. Trezor applies a high level of encryption to secure the funds stored in the wallet. Even if the device is used on a compromised computer, sensitive details will not be leaked due to this encryption. The Trezor wallet arrives in a sealed package. Users can know if the package has been tampered with based on if the seal is broken or not. Clear set-up instructions are provided in the package which makes the set-up process clear for beginners. It is important to take careful note of the recovery seed provided and the instructions will also emphasize this. This can be used to recover funds in the event that the device is lost or stolen. If the device is stolen, no-one will be able to access it due to the high level of encryption. It is important to carefully store the recovery seed as if it is accessed by someone else, they will be able to access the funds on another device. Trezor also has extra applications and features. The Trezor password manager applies the high level of encryption of the Trezor device to managing passwords so that passwords are protected. Overall, hardware wallets such as Trezor and Ledger Nano S are the best option for users who are taking their security seriously. They require an initial investment but when users hold a significant amount of cryptocurrencies, it is worth securing them. Trezor has two different models. The initial Trezor Model One was the device released in 2014. In 2017, Trezor released the Model T. The key difference with the newer model is that it has a colour touchscreen and no buttons. Mycelium is a highly regarded mobile wallet which focuses solely on Bitcoin. Users can use it to secure, send, and receive Bitcoin easily through their phone as is the case with most wallets. Users can easily send and receive transactions and also generate a QR code to receive transactions. The private key is stored by Mycelium but advanced encryption is applied making it accessible to only the wallet user. The high level of security along with potential integrations is what makes Mycelium stand above competitors. The wallet is hierarchical deterministic which enables users of the wallet to generate multiple public and private key pairs. With hardware wallets such as Trezor and Ledger Nano S, the device needs to be connected to a computer to monitor the account balance. Mycelium enables the Ledger Nano S and Trezor wallets to be imported so that users can monitor the account balances from their mobile. Other integrations enable users to hedge investments against fiat currency and to pay their bills within the SEPA region. Electrum is a desktop wallet that focuses solely on Bitcoin. The wallet is compatible with Windows, OSX, and Linux. There is also a version available for Android. The wallet has a high standard of security. The private keys are encrypted and stored on the user’s device and kept offline. Users can also keep the wallet itself offline so that the funds are in cold storage. This means that wallet users would not be able to send any transactions as the wallet would not be connected to the internet but the funds would benefit from a greater level of security. Users setting up the Electrum wallet will be taken through a clear recovery process. Users also have the option to enable two-factor authentication to add an extra layer of security. Electrum has a number of other features and also integrates with third-party services and applications. The wallet has multisig functionality enabling transactions to require multiple signatures before being valid. The wallet can also be integrated with hardware devices so that users can monitor the balance of their hardware wallet and also accept transactions via the QR which can be generated. The wallet was created in 2011 giving it a long history and strong reputation. The code for the wallet is also open source which has enabled numerous developers to contribute to the project and to also assess the security of the project. Paper wallets are another option for storing and securing Bitcoin. It makes it more difficult to send transactions but users can easily receive transactions and secure them offline. Paper wallets provide both a public key and private key on paper. Users can use the public key to receive transactions which will be stored offline in cold storage. To send transactions, users import the private key into services which enable users to import paper wallets such as blockchain.com. Paper wallet providers such as bitcoinpaperwallet.com and walletgenerator.net enable users to easily generate paper wallets for Bitcoin. Although web-based wallets are typically a poor level of security, Blockchain has built a considerable reputation as a wallet provider. Blockchain has provided over 31 Million wallets and its wallets are available in both the web browser and on Android and iOS. One of the key benefits of the wallet is the ease of use. The wallet is extremely straightforward for a user to set-up and to use. The wallet is available in 25 languages catering for a global user base. One of the main drawbacks is that the private key of the wallet is stored by Blockchain. Encryption is applied so that the private key can only be accessed with a password. The mobile support makes it easy for users to integrate Bitcoin into their day-to-day life. 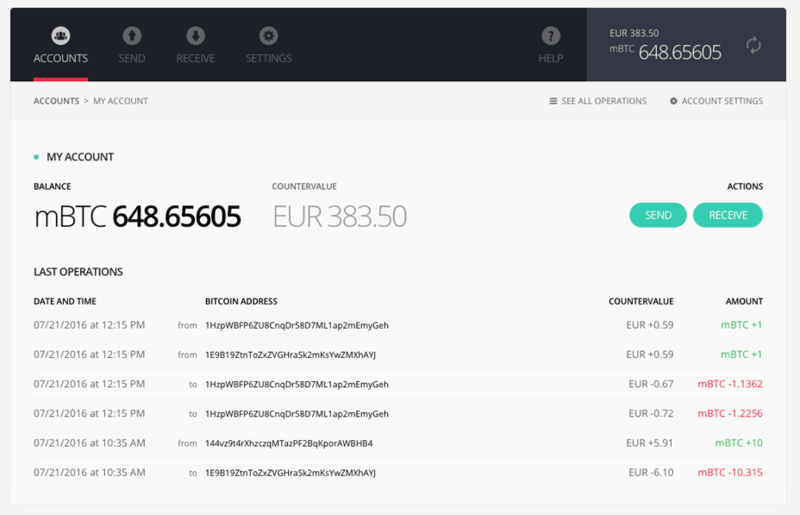 Users can easily send, receive, and store Bitcoin with the Blockchain wallet. A QR code can be generated to easily receive Bitcoin. The wallet also provides exchange services enabling users to exchange between cryptocurrencies. Other supported cryptocurrencies include Ether, Bitcoin Cash, and Stellar Lumens. The wallet also has many attractive features. The wallet is hierarchical deterministic and has multisig functionality. The wallet is also open source enabling developers to assess its level of security. Overall, the wallet is a strong option to consider mainly for its ease of use and is very suitable for beginners. Leaving funds on an exchange is commonly advised against. One of the main issues with leaving funds on an exchange is that you can mostly never know if the exchange has them. The exchange could easily be just keeping a fraction of deposits and using the rest to make risky investments where they might make a return. Kraken was the first exchange to conduct a proof of reserves audit. Users can independently verify that the exchange holds each users funds by providing a way for users to cryptographically check that the exchange holds their balance. Kraken also holds the vast majority of users funds in cold storage. For more infor about the Kraken exchange, you can learn more on our detailed Kraken exchange review. The Coinbase exchange platform offers an excellent wallet service especially for beginners. Wallets can be confusing at the start. If overwhelmed with the different options and features, it is sometimes better to use an exchange. If a wallet is being used and the user does not understand how to operate it, there is the possibility that the user could make a mistake and risk losing the funds. The most well-known exchange for simplifying the process of buying and storing Bitcoin is Coinbase. Coinbase enables users to purchase Bitcoin with their fiat currency by either depositing to their account through a wire or SEPA transfer or purchasing immediately via prepaid card. Coinbase has simplified the wallet so that is understandable for the everyday beginner. When depositing, users will have a wallet for their fiat currencies and users will have a separate wallet for their cryptocurrency once it is purchased. Users can also easily send and receive from the cryptocurrency wallet. A QR code or address can be used to receive cryptocurrency. The security of the wallet is not optimal as it places Coinbase in control of the funds but it is easily understandable to those with little experience. With Coinbase having a strong focus on compliance, consumer protection regulations may add an extra layer of protection to users funds depending on where the user is based. Coinbase operates in over 30 countries including the United States. If you click here you will earn an extra $10, and so do we, upon your first deposit. 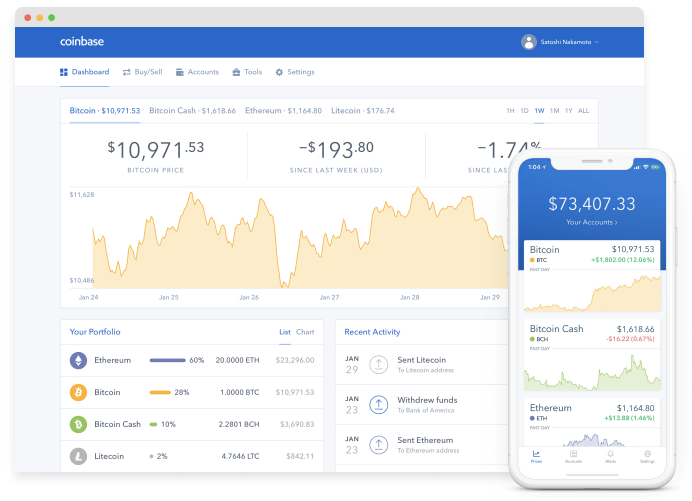 For more info about Coinbase you can check out our detailed Coinbase review. Each wallet has their own benefits and drawbacks. The additional wallets noted below are worth strong consideration and may even cater better for some specific needs you may have when securing Bitcoin. If users are willing to invest in a hardware wallet, there are other options apart from Trezor and Ledger Nano S. KeepKey is the other major hardware wallet provider. Blockchain has also recently released their own hardware wallet which may become a major provider going forward. If supporting multiple cryptocurrencies and the ability to exchange between them is what users are seeking, Exodus provides a strong desktop wallet. The wallet supports almost 100 cryptocurrencies and users can easily exchange between them via an integration with ShapeShift. The interface is professionally designed as well and enables users to view their cryptocurrency holdings at one glance. BTC.com operate a wallet similar to Blockchain. They have a strong focus on making it easy for user’s to set up and operate the wallet. The wallet is supported in the web browser, and on the Mobile in both Android and iOS. Private keys are stored by BTC.com but are encrypted with the users password. The wallet also has two-factor authentication if users wish to add an extra layer of security and supports multisig transactions.